An increased density of users and devices brings unique challenges to the office setting. Dasher has invested in training and hiring expert IT infrastructure wireless and security networking engineers. Below is our set of best practices specific to architecting and deploying wireless solutions. Create predictive heat maps based on floor plans. Use assessment tools to “walk the floor” and collect live data. Complete Dasher detailed client interview forms. Define current state and desired future state (5-year planning). Architect wired and wireless networking solution. Create complete visio architecture documents. Build playbooks for deployment and management. Create client requirements document (used during the integration and deployment). Deploy a small trial at the client location. For example, we like to deploy a 5 AP PoC for a small subset of users. Learn how the environment will work with the new design. Deploy PoC for network access control as part of the solution. Plan final deployment including physical install of the total solution. Test and measure after the deployment with the same assessment tools used in step 1. Deliver final documentation and training for end users and IT staff as needed. Offer managed networking services as needed. In wireless networks, the first and probably most important thing to design properly is the wired network infrastructure that supports the deployment. We have a 50 question “Client Interview Form” that delves deep into the details needed to accurately create and size a wired and wireless solution. If security and network access control are required, we use another interview form to ensure we understand the total set of requirements for this client. Once these forms are completed and a site walk through utilizing our wireless assessment tools has been performed, Dasher can accurately create an architecture, and compare and contrast different industry solutions to find the best fit for each client situation. Imagine you are considering using high bandwidth single connections to each AP taking advantage of Aruba Smart Rate or Cisco Mgig (multigigabit). The design of the edge and core campus wired network becomes critical to supporting the wireless network and your users. If you do not purchase the correct AP or you do not invest in the correct edge switch, you will not be able to take advantage of the additional bandwidth. Clients also need to take into account that many of the edge switches offered today do not have enough power to provide every port of a 24 or 48 port switch with enough PoE to power all devices at the higher SmartRate/Mgig bandwidth settings. We work with our clients to inform them of the options available to them in order to select the correct number of APs needed to be high bandwidth and analyze that as part of the overall investment figures used when sizing a wireless solution. When designing wireless solutions it is critical to discuss security and how network access control will be managed. New technologies, like 802.1X Port-Based NAC, will drive wireless designs based on security. At the same time, considerations for density of users will drive bandwidth and AP placement decisions. The market for NAC solutions is growing with many new players entering the marketplace. Today the leading solutions are ClearPass from Aruba Networks and Cisco ISE (Identity Services Engine). We will cover NAC solutions in more detail in a future blog. Dasher has invested in three different wired and wireless assessment and visualization tools that we use to create designs for wired and wireless environments. These tools enable us to survey existing buildings to determine what a network should look like and to capture current usage patterns and coverage of existing wireless environments, as well as the interference that will impact a wireless design. The first figure below is an example of a 5Ghz coverage map. 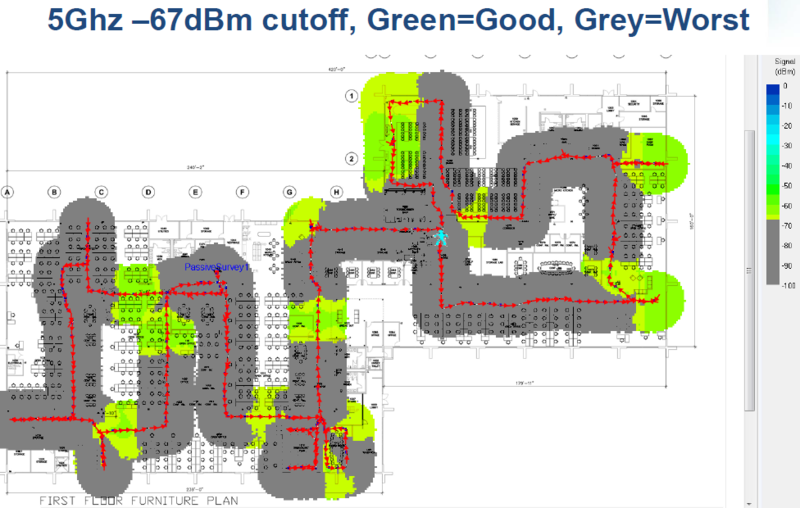 In this example, grey areas represent poor 5Ghz coverage and green represent good coverage. We use the data captured by these tools during the assessment phase to determine placement and power for each AP and how to configure the wireless environment. It is no surprise that we find very hostile wireless environments in high rise urban locations, but you might be surprised to hear that we find similar issues with our clients in “business parks” as well. We have used these tools to help our clients diagnose esoteric problems like wireless de-authorization floods being directed toward our their networks. 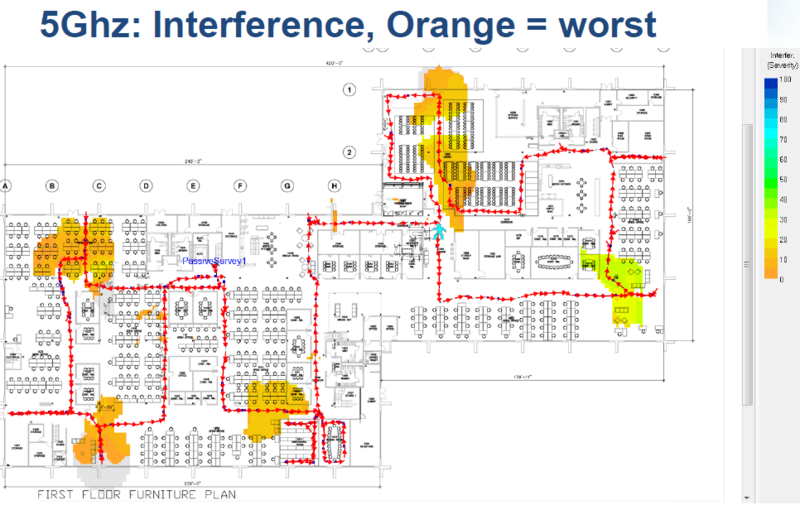 The diagram below is an interference map for the 5Ghz band where interference was seen in some areas of the existing building depicted in orange. When we complete a deployment we go back in with our assessment tools to reassess the environment to make sure the “as built” configuration matches the intended coverage model and minimizes interference. We then tune the APs for such things as signal strength and channel selection. Without this step we would never know for sure if our deployment met the goals of our design. A final key component is the decision about physical or virtual controllers either on premise or in the cloud. 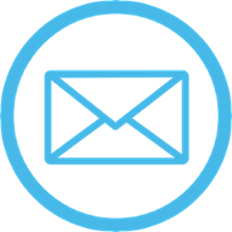 When the project is complete, Dasher understands that your team will need to be trained to manage the solution or perhaps you would like to work with one of our managed services partners. We will delve into all of the options as part of the architecture phase and compare and contrast solutions from the leading vendors in the marketplace that have either physical or virtual wireless controllers. Dasher has an extensive amount of experience working on the technical options and will also weigh the business pros and cons of each from our major wireless partners including Aerohive, Aruba Networks, Cisco Aironet, Cisco Meraki, Mojo Networks, Ruckus and Xirrus. You can find all of our partners here. In November of 2015, we published a mini case study about one of our clients that is a real world example of some of these things we have covered in this blog post. In July of 2015, we commented on a few new partners to Dasher related to networking in this blog post. Click on the button below to contact Dasher directly.